Four Latin Americans and a Guyanese appeared in court on Friday on separate charges of forgery and overstaying time in Guyana. A guilty plea was entered for Cuban male named Alberto Rodrigues Costas. It is alleged that between April 30, 2016 and July 29, 2016, in Georgetown, Costas failed to comply with any conditions of a permit granted to him, in that having been permitted to stay in Guyana during the said time period, he overstayed his welcome. When asked by the translator whether he wanted to plea guilty or not guilty, the Cuban national responded that he did not feel guilty but be felt cheated, and he only wanted to stay and work. Given this response, Magistrate Judy Latchman decided to enter the guilty plea for the defendant. 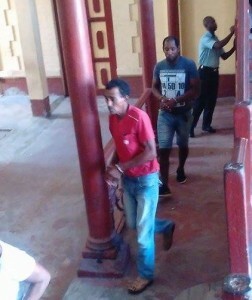 In presenting the facts of the matter, Police Prosecutor Gonsalves stated that the defendant arrived in Guyana via the Cheddi Jagan International Airport (CJIA), Timehri. The court heard that the defendant’s passport was stamped by immigration officials and he was granted stay in the country for a period of three months. The defendant however overstayed his time, without having any extension legally made to his permit. He was arrested and charged with the offence. When asked by the Magistrate why he left Cuba to travel to Guyana, the 52-year-old said, “para visitar” – to visit. While here in Guyana, Costas was employed as a construction worker. He was fined GYD$60,000 or in default 30 days in prison. The Magistrate ordered his immediate deportation following payment of the fine or prison time spent. When the fine was handed down, the defendant told the translator to ask the Magistrate how he will get to pay it if he is not given the chance to earn the money. To this, the magistrate repeated her judgement. The second accused was Yubisley Frank Pecho Quintana. The charge against him is that between June 14, 2016 and July 13, 2016, in Georgetown, he too failed to comply with any conditions of a permit granted to him, in that; having been permitted to stay in Guyana during the said time period, he overstayed his welcome. When it was his turn to enter a plea, the 32-year-old said he is guilty, and that because he doesn’t understand English very well he is in this predicament. According to the prosecutor’s facts, Quintana also entered Guyana via CJIA and his passport was stamped for a stay of one month. However, he overstayed his welcome. Gonsalves said that on October 27, 2016, police acting on information went to the Union House on the West Bank Demerara, where they found the defendant. He was asked to present his travel document and it was discovered that his time in Guyana was up. He was arrested and charged. Quintana was also fined $60,000 or in default would spend on month in prison, after which he is scheduled for immediate deportation. Next, a visibly upset Providencia Esperanza Grullon Guzman reluctantly stood before the magistrate. She, a Dominican Republic national, faced two charges, the first being the same as her two male counterparts. She entered Guyana on April 14, 2016 and should have left on May 13, 2016. She didn’t do so, however, but decided to remain with her Guyanese boyfriend at his East Ruimveldt residence. The second charge against Guzman, is that between April 14, 2016 and October 26, 2016, she conspired with persons to commit a felony, to wit a forgery. That is to say she arrived in Guyana and was granted one month’s stay, and she forged a passport stamp for an extension of three months, on page 7 of her Domincan Republic passport #SE3374751 in favour of herself, purporting to show that same was stamped by Guyana immigration officials at CJIA. The 26-year-old, who was represented by Attorney Paul Fung-a-Fat, chose to plead not guilty to both charges, and has been remanded to prison until November 4, 2016. Guzman’s boyfriend, Kenrick Bourne, was the next to face Magistrate Latchman, and he answered to charges of forgery. Bourne allegedly assisted in forging his girlfriend’s passport, by uttering same to an immigration officer, Constable Errol Charles, on October 26, 2016. He pleaded not guilty to the charge. According to Fung-a-Fat who also represented this accused, his client’s girlfriend asked him to have her stay in Guyana extended by three months, and he complied. The lawyer said Bourne apparently applied for a one month extension for the Dominican Republic national, without realising that it had been changed to three months, and so he was accused of he crime. Despite the lawyer’s attempt to convince the magistrate to grant bail, same was refused. He too will reappear in court on November 4, 2016. Finally, the soft-spoken Rosario Palanco Deleidy stood before the magistrate. She too, from the Dominican Republic, answered to the charge of overstaying her time in Guyana. Rosario arrived on August 8, 2016 and was scheduled to leave on September 7, 2016, and failed to do so. Fung-a-Fat also represented this defendant, and he said his client came to Guyana in vacation and fell in love with Rawle Fraser, a Guyanese who was also present in court. The court heart that the two are engaged to be married, and are actually awaiting some documents from the Home Affairs Ministry to take the big step. Since it was the accused’s birthday, the lawyer appealed to madam to grant the 28-year-old bail, as a birthday present. He explained that the fiance was willing to tie the knot on that very afternoon so that Rosario could remain in Guyana as a Guyanese. Bail was however refused. This caused Deleidy to change her not guilty plea to one of guilty. Fung-a-Fat explained this time, that the defendant will pay the fine and accept deportation, and her fiancé will travel to the Dominican Republic to marry her. She was then fined $60,000 or would spend 30 days in prison, following which she would be deported.